"I burned through Krysten Ritter's hugely accomplished debut. Bonfire is dark, disturbing, and compulsively readable." KRYSTEN RITTER is well-known for her starring roles in the award-winning Netflix original series Marvel’s Jessica Jones and cult favorite Don’t Trust the B---- in Apartment 23, as well as her pivotal role on AMC’s Breaking Bad. Ritter’s work on film includes Big Eyes, Listen Up Philip, Life Happens, Confessions of a Shopaholic, and She’s Out of My League. She is the founder of Silent Machine, a production company that aims to highlight complex female protagonists. Ritter and her dog, Mikey, split their time between New York and Los Angeles. 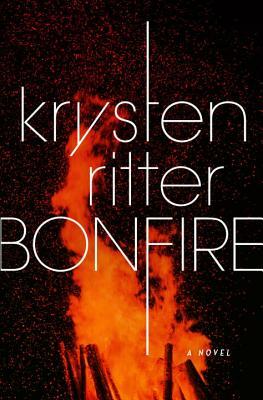 “Bonfire is a stone-cold stunner—the writing is dazzling, the suspense is creeping, and the story of a woman returning home to face her past is brimming with emotion and truth. An extraordinary debut from a major talent." "A vicious years-old small-town scandal makes the perfect backdrop for this gritty, moody mystery that will have readers ripping through the pages at top speed. Bonfire ushers in a bold new voice to the suspense genre. I can't wait to see what Ritter dreams up next." "Actress Ritter (Marvel's Jessica Jones) makes a triumphant fiction debut with this pulse-pounding thriller featuring a sympathetic, broken lead character... Pitch-perfect."